Welcome to the Home of the Bowie Baysox presented by Money One Federal Credit Union! Celebrating our 27th season as a PROUD Affiliate of the Baltimore Orioles! For ADA Accessible seating, please contact our Box Office at (301) 464-4865 during regular business hours. Join us for our first FIREWORKS show of the season! Tonight's show is presented by Educational System Federal Credit Union. The Baysox and Educational Systems Federal Credit Union are also pleased to present Southern Maryland READ AND HIT A HOME RUN READING NIGHT! PLEASE NOTE: The Special Offer Code for Reading tickets for this game ends as of 11:59pm on Friday, April 26. Discounted tickets are unfortunately not available on the day of the game. Gates open 5:30pm. Pre-game ceremonies begin approximately 6:00pm. Baysox game time is 6:35pm. Kids12 and under run the bases every night! Please note: For the safety of our fans, protective see through netting has been installed from Section 115 on the first baseside through Section 116 on the third base side. 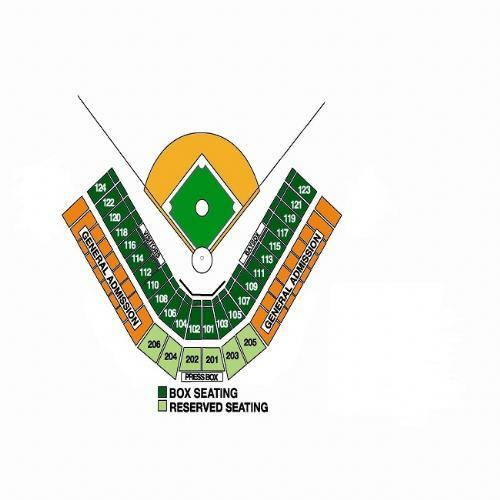 In each section of the Ballpark, Row A is closest to the field with Row P/Q, being closest to the concourse. Your tickets are valid for the game date that they are purchased for ONLY. If you think that your plans may change, please consider adding ASSURANCE. Assurance will allow you to change the date of your tickets ONE time if for any reason you are unable to attend your initially chosen game. ASSURANCE must be added at the time tickets are first purchased and cannot be added after the transaction is complete. ASSURANCE is not refundable if it is not used. Tickets purchased using a SPECIAL OFFER/PROMO CODE are valid for the game date they are purchased for ONLY and are not eligible for added ASSURANCE. SAVE TIME AND MONEY by purchasing your tickets IN ADVANCE! Game Day pricing takes effect at 12:00 midnight the day of a scheduled game. Save money by purchasing your tickets ahead of time! Come to more than one game a season? Our FLEXIBLE ticket plans can save you even more! Log on to our website at www.baysox.com or stop by Fan Assistance during the game for more information. If you have any children age 2 and under attending the game with you, they do receive a FREE general admission ticket to the game, which you may pick up right at the gate. In the BOX and RESERVED sections, children 2 and under are considered "lap children" and are not assigned an actual seat. If your child will require a seat of their own, you will need to purchase a seat for them. NO OUTSIDE FOOD OR DRINK PERMITTED INSIDE PRINCE GEORGE'S STADIUM. TICKETS ARE NOT REFUNDABLE ONCE PURCHASED. Phone Sales end 4 hour prior to scheduled game time. Tickets may be purchased at our Box Office Windows through the Top of the 7th inning of today's game. Tickets that are sent to "Will Call" more than 14 days prior to the event date will automatically be mailed to the address provided during the ordering process. Will Call tickets purchased less than 14 days in advance will be available for pick up at the Box Office Will Call on the day of the event. Please have photo ID available when picking up your tickets. Print your tickets AT HOME! Your purchased tickets will automatically be sent to our Box Office Will Call. If you would prefer to print your tickets at home, select PRINT-AT-HOME under Ticket Delivery Options. Bring your printed ticket right to the Gates and bypass our Box Office on game day! If you are using a SPECIAL OFFER/PROMO CODE please enter it above using ALL CAPITAL LETTERS (no spaces) and hit "submit" to see your offer. Special Offer/Promo Codes are available online ONLY and will not be honored at our Box Office. For questions, please contact our Box Office at (301) 464-4865 during regular business hours. PLEASE NOTE: A $1.50 per ticket web processing fee will be added at time of checkout.